Why does it feel like making menus and interface stuff for a game takes three times the amount of work to actually make the game itself? I'm trying to churn through these menus and stuff as fast as I can, and I got some ideas for how to even make more work for myself... but for now here's the stats screen for Sky Sisters. Pretty simple compared to what I originally wanted, but I realized that not every single little thing needs to be tracked. 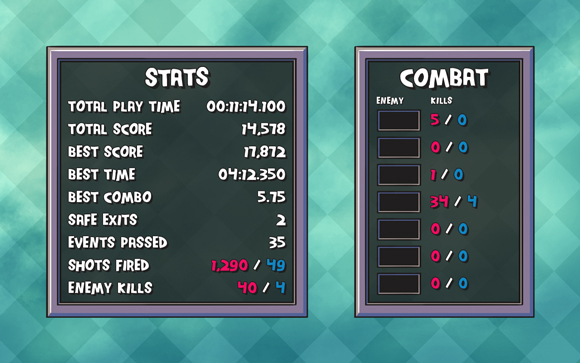 For example there was a lot more stats per enemy, but then as I played the game I realized that you're only interacting with enemies only a small portion of the time, so I reduced it down to just how many times each player has killed an enemy. Okay only two more menu screens to go, one of them is pretty straight forward and the other is complicated as hell so we'll see where I end up with that next week! 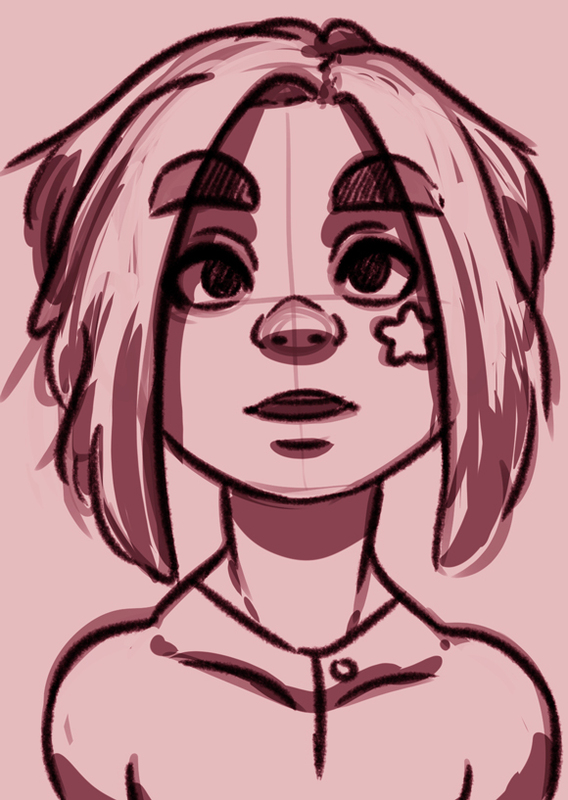 In such a drawing rut lately. 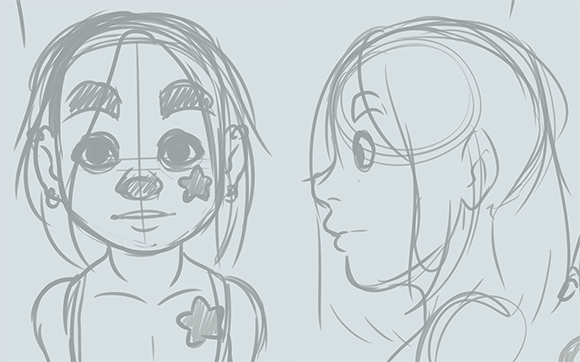 Out of a huge page of stuff these are the only two scribbles I liked oh well. I'm almost done with all of these menus for Super Sky Sisters! One thing I wanted to add was a bare minimal hud for players that wanted to see as much of the sky as possible. 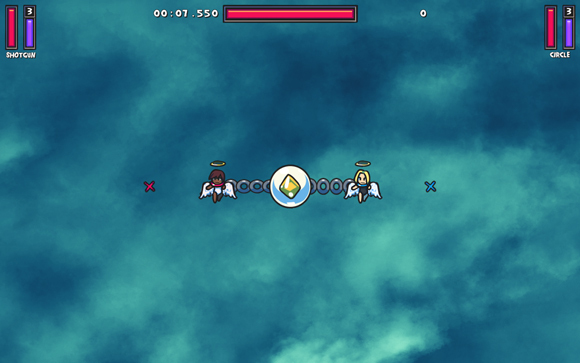 I've also made some changes to the main hud that make it a little bit smaller and less intrusive, but we'll see if that's enough. I figure adding the minimal hud is a good option for people that don't like the normal one. I'll probably still make some changes to this but for now I'm happy with it. 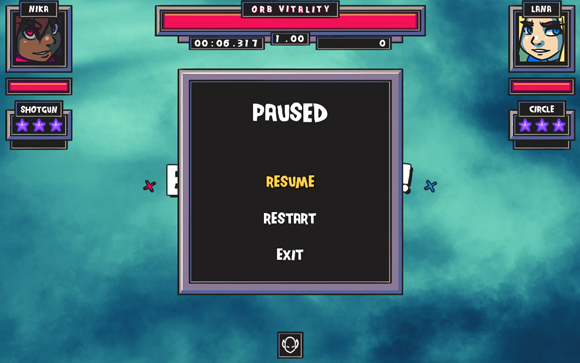 I also added a simple pause screen finally to the main game play because I noticed that I had to actually close the game and reopen it if I wanted to back out of the gameplay scene, whoops. Everyone wants to be able to customize their keyboard controls in games, and I think I figured out a pretty straight forward way to do just that in my menu system for Super Sky Sisters. You can configure each player's keyboard controls to make the set up that best works for you. On keyboards with a numpad it's definitely a good option to have one player set up on the numpad, but on laptop keyboards this isn't the case. Right now you can't edit the game controller controls because I think I want to make those locked in at least for right now. The to do list grows shorter! But I still need audio for this game, whoops! 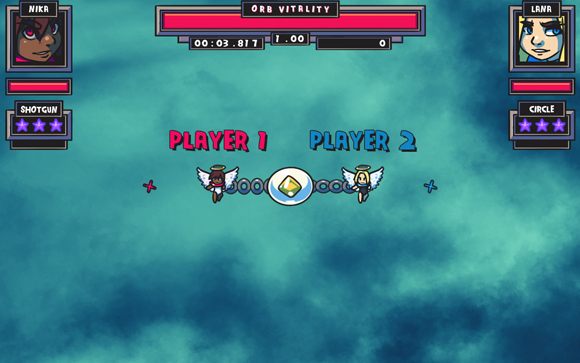 Working away at some of the menu stuff for Super Sky Sisters. Every time I have to code menus it amazes me how long it takes compared to making the actual game. 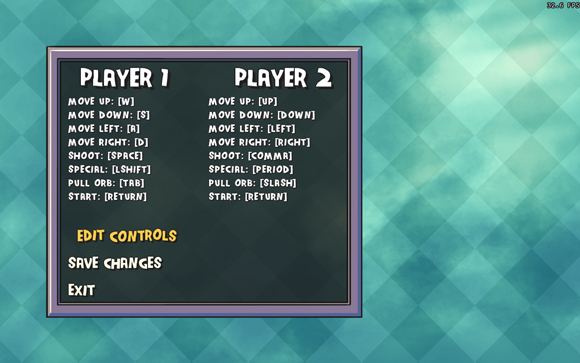 I think I spend as much time on menus as I do actually coding the game play which feels totally insane to me. 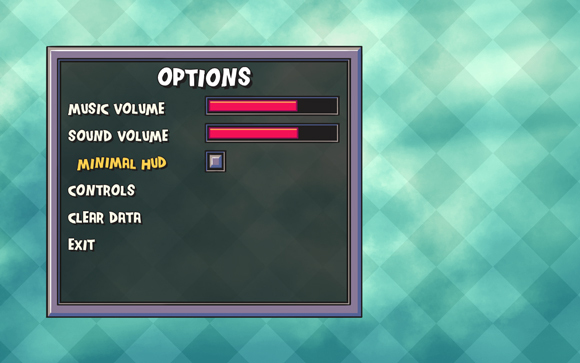 These menus are built for the preview or demo version of the game that I've been showing off, but at this point they'll probably be the final menus of the game once I add some more sprinklings of artwork to them. I spent some time trying to figure out a cool fade out and fade in effect using clouds and a sky type thing, but honestly I everything I tried with clouds fading in looked like crap. So I went for the simple style of having diamonds fill in the screen for the fade which looks super neat and is really easy to do. I just render a square graphic that's been rotated a bunch of times over the screen, and the scale of that graphic is controlled by a value in my Overlay entity, so to fade in and out I just tween that value between 0 and 1.